December of 2018. May I congratulate you on coming to the finish of a year of growth. The year began with insight and ends with insight, but the middle was a dig, wasn’t it? This year saw slightly better and improving awareness of health disparities confronting black mothers and babies in the US. More doula coverage emerges in US cities to address the social support so effective in reducing these deaths and prematurity. San Francisco and Boston are examples. Doula care, listening to and believing pregnant people when they present with concerns, better breastfeeding support, and delaying cord clamping are immediately available. Six Spinning Babies® Approved Trainers have been busy giving workshops and supporting positive change around the world. All six traveled to present physiological birth topics at the Sia Parto Spinning Babies Congress in Brazil with Ana Cris Duarte and friends. Lorenza Holt shared about a Quality Improvement collaboration she nurtured with a community hospital using Spinning Babies. 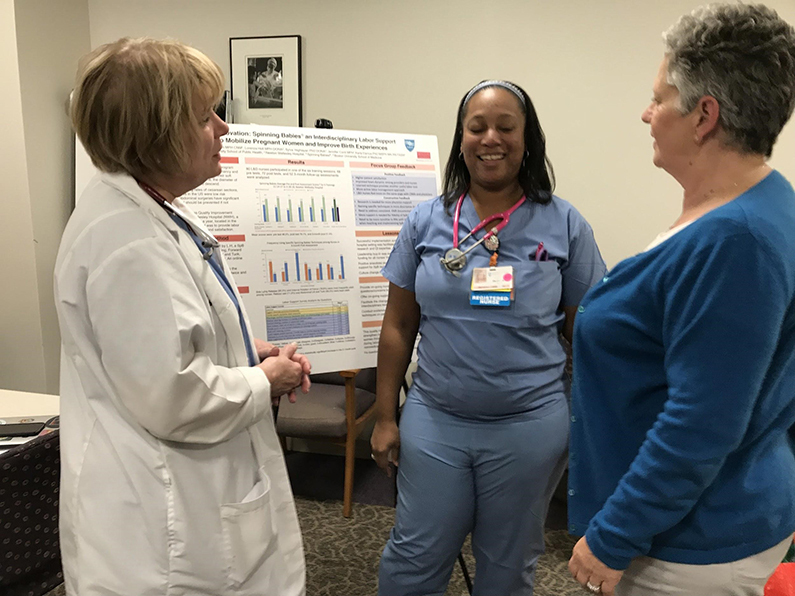 Nurse satisfaction in labor and delivery increased with use of Spinning Babies – we were thrilled with positive results. 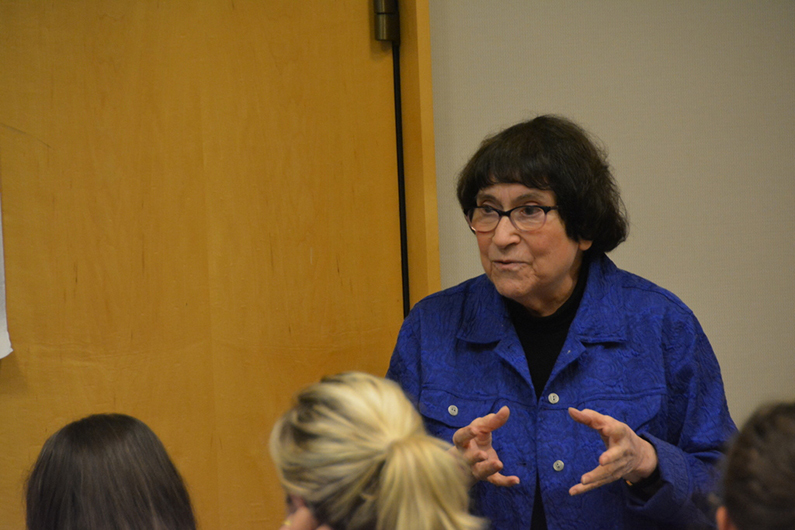 Phyllis Klaus has been an inspiration in our work. She and Spinning Babies® Approved Trainer Tammy Ryan will present When Survivors Give Birth on January 13 in Palo Alto, CA. Don’t miss it! To change our world for the better, we start at home…. And for us, our office home. We were blessed with adding Marni Worlein to our administrative core. We welcomed Jennifer Tremper to social media and she is also amazing to help with the website, images, and our email newsletters! We’re working with Emme Corbeil to communicate with our emerging Certified Parent Educator community and get their paperwork processed, Tania de Filippis is serving this same role in Brazil, and Isabelle Karamov came in to review the program and strengthen it for the future. Melissa Koch, our Integrator (you may recognize the term Executive Director), Marni, and I have been increasing our capacity as we work with EOS and our team coach Trish Gardiner. We’re looking to expand with a technologically savvy administrative and special projects assistant for Melissa and Gail is still hoping Mary Poppins (aka a personal assistant) appears on an east wind. In 2018, our Spinning Babies® Approved Trainers presented 149 workshops to over 3,200 birth care providers in 31 countries on 6 continents. Many thousands more learned about Spinning Babies® at conference presentations in Brazil, Jerusalem, The Netherlands, and more locations. The Spinning Babies® Certified Parent Educator Training program emerged this year through five trainings, with 190 trained and 37 already fully certified. Our childbirth educator community is active and teaching parents how to prepare for an easier birth with fetal positioning while increasing pregnancy comfort. Parents now can find in-person Spinning Babies® Parent Class where these dedicated Certified Parent Educators live and work. 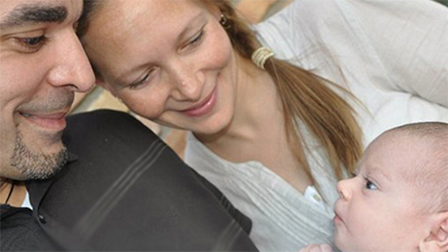 Spinning Babies® Certified Parent Educators do one-on-one education as well as group classes. 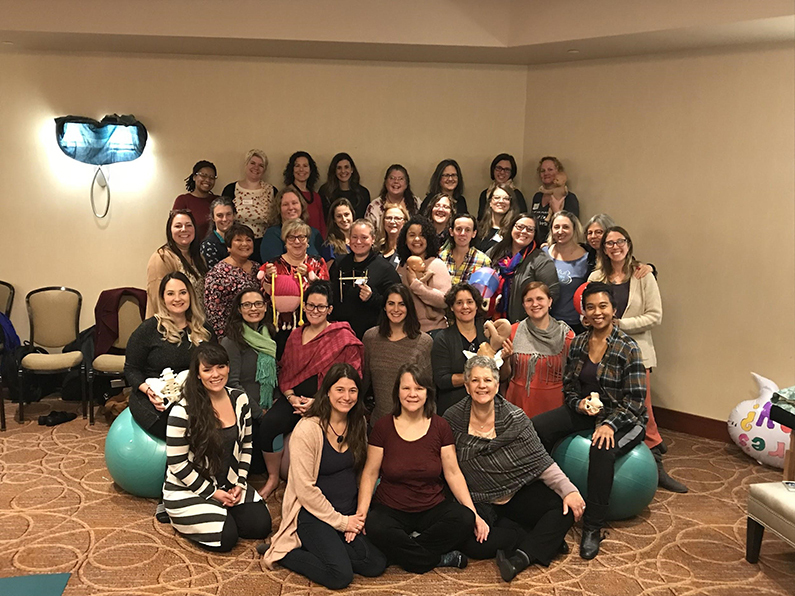 We have four 2019 trainings (The Netherlands, Toronto, Seattle, and Jerusalem) for those childbirth educators who have taken the Spinning Babies® Workshop and want to present this approach to pregnant parents. Meet our Certified Parent Educators and see if there is one near you. We’re exploring new avenues for bodyworkers to be trained in the Spinning Babies approach to expand our already lovely Spinning Babies® Aware Practitioner listing on our website. I tuned into the jiggle techniques this year (jiggled not shaken). The Bum Jiggle emerges on the Spinning Babies scene thanks to Jenny Blyth and Fiona Hallinan, of Australia. Done correctly for 3-5 minutes or longer activates the parasympathetics. I hope to make it contagious. An activated parasympathetic nervous system improves gestation, emotional outlook, and comfort. Better pregnancy outcomes may be possible with regular use of jiggle techniques. Thank you for being with us! It’s been 20 years since the first time I used the words Spinning Babies. I can’t wait to show you 21! 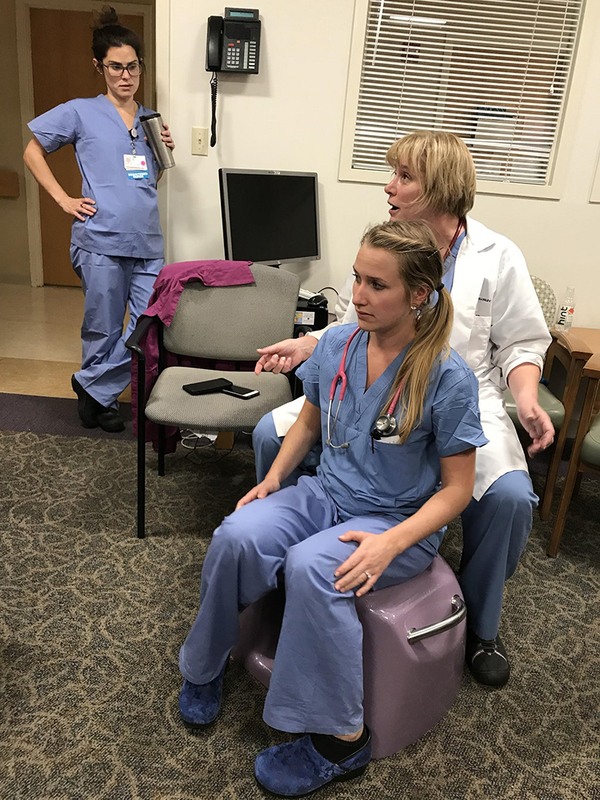 Parent Class shows how to recognize labor stalls and shows birth positions that help make room for the baby to rotate more easily and slip through the pelvis. Professional bodyworkers will appreciate the 2-hour video mini-class with Dr. Carol Phillips, DC. Better Birth with Body Balancing.